CPA is the closest point of approach. It indicates the closest distance that target and your vessel will be from one another if both vessels continue on the same course and speed. TCPA is the time until CPA. It is the amount of time that will elapse before the closest point will be reached. BRG is the current bearing to the target. It is displayed in either magnetic or true degrees, depending on a user setting. 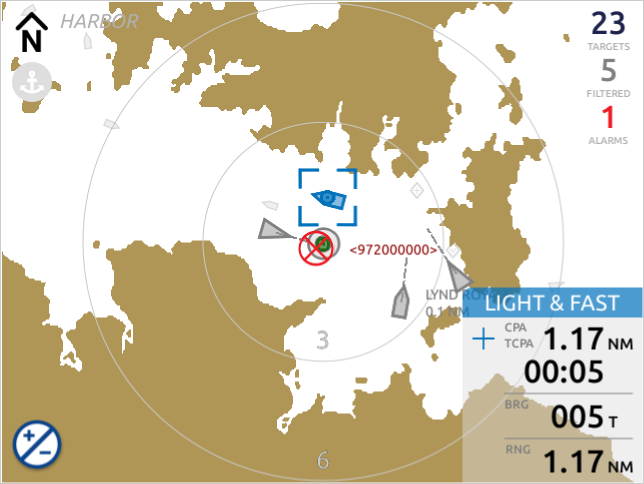 RNG is the current distance in nautical miles to the target. Hint:If you want to further preserve screen real estate you can also reduce the size of this details view to just show CPA and TCPA. This can be done from the Target Options under the Plotter Menu. Touch these details to bring up the full target details display. This view shows all available information about the target. The exact information will depend on the type of target and information that has been received. AIS transmissions occur over time and it is normal for it to take several minutes for all target information to be available. 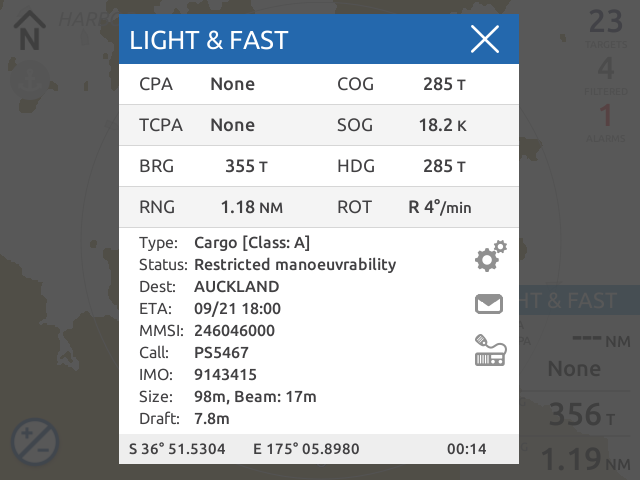 A unique feature of your WatchMate Vision is its ability to remember the target details for each vessel it has encountered. As a result, your WatchMate Vision "learns" about the targets you encounter frequently and makes their information available immediately without having to wait for it to be received each time that target appears again. An important piece of information is how recently the position of the target was last received. Consult this time at the bottom of the target details to determine the accuracy and validity of the target's position.